Mitchell Dental Spa is a dentist’s office as well as a luxurious spa. We offer 10- to 15-minute complimentary spa treatments with each dental visit, and extended spa services by appointment. We also offer injectable cosmetic treatments at our Chicago practice, including BOTOX® Cosmetic and dermal fillers. A visit to Mitchell Dental Spa is a truly unique experience, combining top-notch dentistry with luxurious amenities, including a fully stocked refreshment bar, afternoon champagne bar, and flat screen TVs in every room. Contact us to make your appointment today! BOTOX® Cosmetic is a very popular treatment for eliminating stubborn wrinkles. It works by blocking nerve impulses to specific muscles that are used repeatedly in facial expressions and cause lines to appear over time. BOTOX® Cosmetic is most often used on forehead lines, between the eyebrows, the outer corners of the eyes, and sometimes on smile lines. Lines and wrinkles are relaxed, helping you look years younger, with results lasting about three to four months. JUVÉDERM® is a dermal filler made of hyaluronic acid, a non-toxic substance that occurs naturally in the body. JUVÉDERM® is very effective at plumping lips and redefining the lip line, reversing the natural loss of volume that occurs with aging. JUVÉDERM® can also be used to treat smile lines (nasiolabial folds) around the mouth. Results last about 6 months in most patients. Restylane® is a versatile filler, also containing hyaluronic acid, that can be used to plump lips and fill in the tiny vertical lines that develop around the lips. It can also treat nasiolabial folds and marionette lines, which run from the mouth to the chin. Restylane® can also fill hollow areas and treat bags under the eyes. Results last for 6 months or more. Radiesse® is a hyaluronic acid-based filler that can provide results that last a year or more. Radiesse® is known to stimulate your own collagen production as it gives a lift to the cheeks and jaw line, and reduces nasolabial folds around the mouth. Dr. Mitchell treats patients with TMJ disorder, a condition that causes pain in the jaw, headaches, and other symptoms. 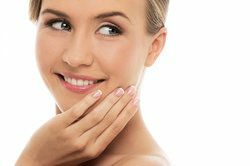 When BOTOX® Medical is applied to the facial muscles around the jaw or “trigger points,” these muscles become relaxed, relieving pain and controlling teeth clenching during sleep. BOTOX® Medical has also been approved by the FDA as a treatment for chronic migraine headaches. Dr. Mitchell treats migraine sufferers with multiple injections of BOTOX® Medical around the head and neck. Administered about every 12 weeks, this treatment has been found to control migraines in patients. At Mitchell Dental Spa, you will love going to the dentist! Dr. Mitchell offers high-quality, full-service cosmetic, restorative and general dentistry in addition to her spa and beauty services. Contact our office today to make an appointment.